The MacBook Air has never been known for its performance. Though it’s incredibly thin and weighs just three pounds, making it great for portability, the Air is Apple’s least-powerful computer—by a significant margin. While some of this performance gap is due to the Air’s low-power (and relatively low-clock-speed) processor, perhaps the computer’s biggest limitation—at least if we’re talking about the entry-level model—is its hard drive. Specifically, the $1499 MacBook Air’s 1.8-inch, 4200rpm drive, the same type of drive found in the iPod classic, just isn’t made for speed. You could opt for to the $1799 Air, which bumps the processor speed from 1.86GHz to 2.13GHz and swaps out the slow, 120GB SATA drive for a faster, 128GB SSD (solid-state drive), but RunCore offers an alternative: replacing the drive in the $1499 MacBook Air with RunCore’s own Pro IV SSD. This solid-state drive is advertised as providing a “5x to 40x” increase in system performance over most SSDs by improving small-file read and write speeds. (The Pro IV SSD also works with the $1799 MacBook Air, although you won’t see as dramatic improvements in performance, given that this model already has an SSD.) And since SSDs generally require less power than traditional hard drives—less, even, than the low-power 1.8-inch models used in the $1499 MacBook Air—you should also see better battery life and cooler internal temperatures, although I didn’t test these aspects of the upgrade. The RunCore upgrade isn’t inexpensive: The LIF-based Pro IV SSD for the “Revision B” and “Revision C” MacBook Air models costs $190 for 32B, $290 for 64GB, and a whopping $480 for the version, at 128GB, that doesn’t require you to make do with less storage than you already have. The ZIF-based Pro IV for the “Revision A” (original) MacBook Air is slightly less expensive at $120 for 16GB, $160 for 32GB, $260 for 64GB, and $460 for 128GB. I tested the 128GB version for the Revision C (current) MacBook Air. 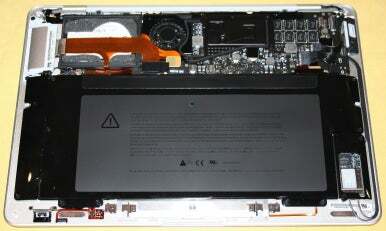 The RunCore Pro IV for the B/C MacBook Air is a do-it-yourself upgrade. Included in the package are the SSD itself, an external SSD/LIF enclosure, a USB cable for the external enclosure, a cable for connecting the SSD inside the Air, a small screwdriver, and two RunCore SSD stickers you can use to identify your hot-rodded MacBook Air to other geeks (or, if you have a bunch of MacBook Airs, to help you keep track of which is which). 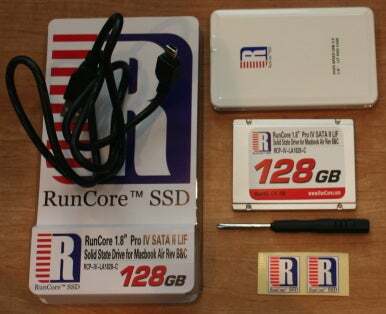 Before performing the upgrade, you place the RunCore SSD in the external enclosure, connect it to your MacBook Air via the USB cable, and then use your favorite drive-cloning software (such as SuperDuper or Carbon Copy Cloner—the latter is included) to clone your existing MacBook Air drive to the RunCore SSD. You then swap the drives, which lets you use the original drive, in the external enclosure, for storage or backups. Or at least that’s how the procedure is supposed to work. The first two units we received didn’t work in the included external enclosure, so we couldn’t clone the Air’s original drive to the new SSD. It turns out that some of the Pro IV units in the initial production run shipped with faulty USB boards—the drives themselves were fine, but the USB enclosure wasn’t functional. RunCore told Macworld that the company has fixed this problem and shipped all previous customers the new, working enclosure; indeed, the next sample we received worked as expected. Current shipments also include a better screwdriver, better instructions for installing the SSD in the USB enclosure (the instructions included with the original units were less than ideal), and newer firmware on the drive itself. For many users, the biggest drawback to the RunCore Pro IV won’t be the price, but rather the installation process. Installing the Pro IV requires you to remove the Air’s bottom case, disconnect and remove its internal battery, disconnect several other internal cables (a couple of which involve the use of a spudger to pry off fragile connectors), move aside several internal brackets and screw covers, and pop the current hard drive out of its bracket—a process that also involves removing 23 tiny screws. Then you have to reverse the process to put the Air back together again. Oh, and don’t break anything in the process; if you do, Apple won’t fix that damage under warranty. In other words, installing the Pro IV SSD isn’t for the faint of heart, nor is it a task that should be undertaken lightly by those who are all thumbs, so to speak. Thankfully, our friends at iFixit provide a manual specifically for replacing the drive in a MacBook Air that includes clear photos and instructions, If you’re somewhat comfortable taking things apart, or are particularly good at following directions, you should be OK. The process of disassembling the Air, swapping the drives, and putting the Air back together again took me about 30 minutes, although if you don’t have a lot of experience with such procedures, it may take you longer. After performing the RunCore upgrade on our test MacBook Air—a $1499 Revision C (current) model with a 1.86GHz processor and a 120GB hard drive—I handed off the Air to the Macworld lab. We ran our standard set of Mac benchmarks to test performance, although we used the older Speedmark 5 suite of tests under Mac OS X 10.5.7, rather than our new Speedmark 6/Snow Leopard suite, because we wanted to be able to compare the upgraded Air’s results with the results from our June review of this model. The table below shows the Speedmark 5 scores for the stock $1499 Air, the $1499 Air upgraded to the RunCore Pro IV SSD, and the stock $1799 Air. The 1.86GHz model’s stock hard drive bested the RunCore SSD in a few tests—hard drives still have advantages for particular tasks. However, the RunCore-upgraded Air was faster in 13 of the 17 tasks, often significantly so. For example, the stock $1499 Air took nearly a minute to duplicate a 1GB file in the Finder; the upgraded Air took a quarter of that time. The stock Air took nearly two minutes to unzip a 2GB file archive; the upgraded Air took only 51 seconds. And the stock Air completed our iPhoto task in 1:32, while the upgraded Air finished in just 36 seconds. Overall, upgrading the entry-level MacBook Air to the RunCore SSD improved its Speedmark score by 42 points, 155 to 197—an impressive 27 percent increase in performance. Compare this to the 13-percent improvement, 155 to 175, you get by opting for the $1799 Air over the $1499 model, and the RunCore SSD is tempting. Best results in bold. For Speedmark and Unreal Tournament, higher scores are better. All other tests are timed results (times listed in minutes:seconds) where lower times are better. Speedmark 5 scores are relative to those of a 1.5GHz Core Solo Mac mini, which is assigned a score of 100. The systems were running Mac OS X 10.5.7 with 2GB of RAM. Test details: We duplicated a 1GB folder in the Finder, created a Zip archive from the two 1GB files, and then Unzipped the archive. The Word and Entourage tests measure the time to scroll through a large document and download a standard set of e-mail messages, respectively. The Pages task performed a search-and-replace of a large document. We converted 45 minutes of AAC audio files to MP3 using iTunes’ High Quality setting. In iMovie, we applied, to a one-minute movie, the Aged Film effect from the Video FX menu and we exported a movie for e-mail. We used Unreal Tournament's average-frames-per-second score; we tested at a resolution of 1,024 by 768 pixels at the Maximum setting with both audio and graphics enabled. We loaded a standard set of Web sites in Camino. We imported 100 photos from the hard drive into iPhoto. The Photoshop Suite test is a set of 14 scripted tasks using a 50MB file. Photoshop’s memory was set to 70 percent and History was set to Minimum. We recorded how long it took to render a scene in Cinema 4D XL. We converted a DVD chapter to H.264. We used Compressor to encode a 6 minute, 26 second DV file using the DVD: Fastest Encode 120 minutes - 4:3 setting.—Macworld Lab testing by James Galbraith. Indeed, comparing the RunCore-upgraded entry-level MacBook Air to the higher-end model provides additional perspective on the benefits of the RunCore SSD. Despite the fact that the $1799 MacBook Air has a faster processor and an SSD of its own, it’s still slower than the RunCore-upgraded entry-level Air on 12 of 18 tasks, and its Speedmark score of 175 falls directly between those of the stock and RunCore-upgraded $1499 models. While the Air will never be a screamer, the RunCore-upgraded model was the first MacBook Air we’ve tested that bests 2008 MacBook models in performance. Small praise? Perhaps. But considering that the stock $1499 Air provides 2006 MacBook performance, the RunCore upgrade is nevertheless impressive. While unquestionably expensive, the RunCore Pro IV’s price doesn’t seem as outlandish once you take performance into account. If you’re in the market for a MacBook Air and you’re considering paying the $300 premium for the $1799 model over the entry-level model, you’ll pay only another $180 to stick with the $1499 model and install the 128GB Pro IV SSD. Going that round provides you over twice the jump in performance (42 Speedmark points versus 20). In other words, if you opted for the MacBook Air for its size and weight, but you crave better performance, the RunCore SSD is appealing. While we didn’t test the RunCore IV for the original MacBook Air, which uses a different drive interface, I suspect it will offer similar performance benefits compared to the stock drives. The RunCore SSD should also offer smaller but significant improvements when installed in the current $1799 Air, although we didn’t test this configuration. Macworld Lab Director James Galbraith contributed to this article.